London seems to gain a new private members club on a weekly basis this year and one would think the capital’s patrons would be getting a little weary; yet another “home-from-home” you say!? However, there is quite a spectacular trend underway; and with each and every one working, our appetite for them only seems to grow. With each opening there is a new flavour, a new approach, a new crowd to attract and all their offerings are managing to achieve one key paradoxical thing: they’re all standing out. Each new club that opens its doors is managing to be really quite different from the last, carving out (often inventing) its own specific niche and finding its members based on appetites as diverse as finance, philosophy, wine, theatre, food and adventure. The brand new South Kensington Club is no different. Joining us on a spring evening were ten special HedgeBrunch guests. A venerable mix of characters from both Work and Play businesses; family offices mixed with global adventurers and risk analysts with sybarites. An art-meets-science combination that made for a lively and enlightening evening. We started with a well-received champagne reception in the first floor club lounge; a colonial style space, which one can clearly see is the result of a healthy sense of global adventure and artistic sensibility. We’d have stayed sipping gin-slings there all evening but our hosts moved us swiftly on to the ground floor eatery. Downstairs is a modern and airy take on the private club dining space. Not a thick-linen table cloth or ingot-heavy couteu in sight, this place has a sunny and cheerful disposition which made for a fresh evening. It’s clean, conversational and not weighed down with the self-important gravitas that is often the key focus in such a space. The Mediterranean menu follows the same tone, as we opened with our flat breads and iced crudités it became clear what we were in for. HedgeBrunch attracts people from across the experience spectrum, but there was a defined sense of next-generation-London running through our collected guests. Each having gained significant experience in their chosen fields which is now being put to good use. If you wanted to find the luxury and financial decision makers of the next few years (at least) you’d have to do no more than meet this group. As we continued with a lively artichoke salad and a simple yet gregarious rigatoni there was a palpable holiday feeling about the occasion. The dining room has a villa-evening-post-day-by-the-pool air about it; it is certainly a room at which one can linger. Deserts (cheesecake and summer berries) rolled into coffee and coffee rolled into talk of summer trips and the need to get fit. Now the sun has returned to London. Of course, by this time of year you’re kidding yourself if you think three weeks in the gym pre-Ibiza is going to make much difference, but there you go. Regardless, given this theme the SKC team had one last final surprise in store. A post prandial tour of the club shone a light on what has to be described as the most impressive health, fitness and well-being offerings we’ve seen in any London club. For more here though – you’ll have to read our upcoming piece on the 10 best spas in London and New York right now. Stay tuned. 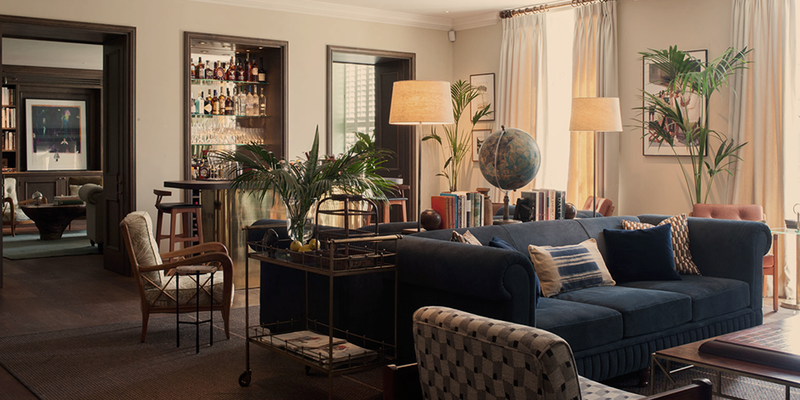 The South Kensington Club is a surprisingly unexpected delight and it goes to show – in such a frenetic city, we still need our homes-from-home. To find out more about the South Kensington Club please click here.